Rep. Dingell: The House's Link To Health-Care History The health care legislation in the House is named for John Dingell, a Democrat from Michigan. He is the longest-serving member in the history of the House, and he was there when Medicare was passed. Dingell's father first introduced a bill calling for universal health coverage in the 1930s. When people think of health care and Congress, often the first name that springs to mind is the late Sen. Edward Kennedy of Massachusetts. While Rep. John Dingell (D-MI) may not be as well known, his legacy on health care is even richer than Kennedy's. 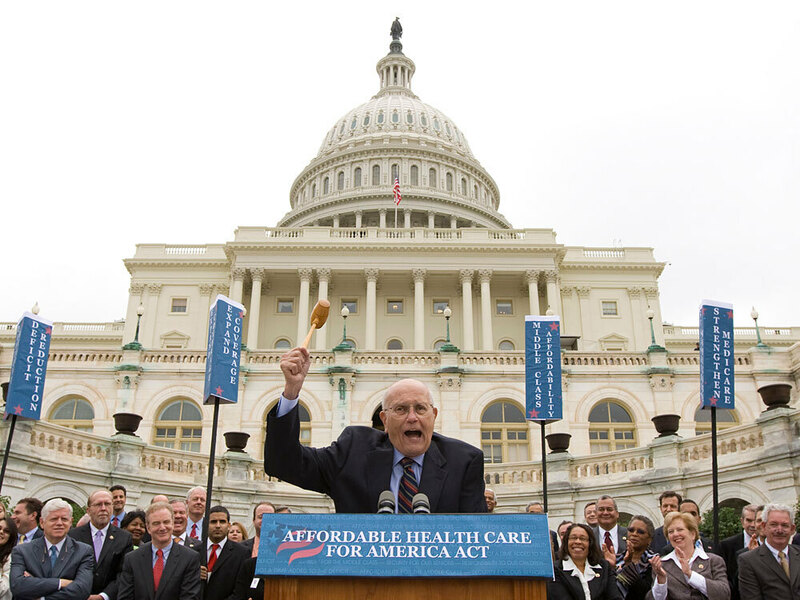 Holding the gavel used when Medicare legislation was first passed, Democratic U.S. Rep. John Dingell of Michigan speaks about health care legislation Oct. 29 on Capitol Hill. And when the House takes up the health overhaul bill this weekend that bears Dingell's name as its lead sponsor, it could cap more than a half-century of effort on his part to bring health insurance to nearly every American. Dingell's quest for universal health care began in 1932, when his father, John Dingell Sr., was first elected to the House from Michigan. The elder Dingell quickly became one of the architects of the New Deal. "If you look at the the picture of Roosevelt signing Social Security, you'll see a little skinny Pollack with a big broken nose and a mustache standing in back of him — that was my dad," Dingell said in an interview in his office on Capitol Hill last week. "And he was very, very proud of that." But Social Security was just the start. In 1943, the elder Dingell, along with Senators Jim Murray of Montana and Robert Wagner of New York, introduced the first national health insurance bill. The so-called Wagner-Murray-Dingell bill was fought over for years, though it never became law. And when the elder Dingell died in 1955, John Dingell Jr. took over not only his father's seat, but also his quest for national health insurance. For the first decade after his father's death, on the first day of each Congress, Dingell introduced a bill to create a Medicare program to provide health insurance for the elderly, as his father had tried and failed to do. But after 1965, he no longer had to. In fact, then-speaker John McCormack gave the still quite junior Dingell the task of presiding over the House when it passed the Medicare bill, "not because I had any merit in the matter — but because he was Dad's great friend and because Dad had been the guy who started the whole business of Medicare," Dingell says. But Dingell did not give up the custom of introducing a national health insurance bill on the first day of every Congress in his father's memory. One nice thing has happened over time, he says: "As I have revised the bill over the years, we found about half of the original legislation has been enacted into law." That includes things like the National Institutes of Health, universal vaccine programs for children, and maternal and child health programs. What Dingell doesn't say is that most of those things were enacted into law under his stewardship at the powerful Energy and Commerce Committee, which he led from 1981 to 1995. California Democrat Henry Waxman ousted the 83-year-old Dingell from the chairmanship this year, but that was over their differences on energy and environmental issues. The two have always seen eye to eye on health care. And Waxman says he was always happy to have Dingell to back him up when it came to tough negotiations. "It was always a relief for me to know that when he and I met with the Senate in conference, we were talking from the same page, believed in the same things, and we were going to fight together," Waxman says. "And that's the reason we've been so successful as we have been in many of the health bills throughout the decades." As chairman, Dingell was legendary for his sometimes overbearing style of interrogation, often berating witnesses. But for all his bluster, says Republican Joe Barton of Texas, who last led the committee for his party, Dingell is actually a very humble person. "He doesn't put his name on bills, so to some extent his legacy is hidden, because it's just the Health Care Policy Act of whatever or the National Institutes of Health whatever," Barton says. "If he were like other members, and they put their names on bills, there'd be dozens of Dingell-something bills, not just in health care, but in energy and telecommunications and many, many other fields." Dingell, who this year became the longest-serving member in the history of the House, says he remains focused on the one bill that has eluded him the longest — health care for all. And will this be the year? "I'm an optimist," he says with the enigmatic Dingell smile.